Rancher Gene Autry takes a job singing on the radio to aid farmers and ranchers whose lands were destroyed by raging floods. Blaming crooked politicians, Gene goes to Washington to try to put through a flood control bill and finds he has a lot to learn. 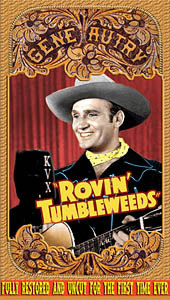 Gene introduces his classic theme song Back in the Saddle Again in this 1939 release. To view the full original release information for this film – song listings, cast and crew, etc. – visit its Film Info page. This VHS is out of print and sold out.